Winemakers who understand the science of the land and the grapes are recognizing similarities to France's Burgundy region in North Carolina, close to the border with Virginia. Yadkin is the name of the valley. Families are intentionally choosing this northwest corner of the state to relocate a grape-growing, winemaking lifestyle, even leaving California's fabled wine regions. Others are launching themselves into the wine life building knowledge in enology and viticulture with the Surry County Community College $5 million center offering intense-study degrees and a multitude of on-line courses too. What's in it for the traveler? Plenty. Hotels next to vineyards. Cabins in the vineyard. Chefs pairing fine cuisine with local wines. Estate wineries growing and producing everything, and downtown tasting rooms and restaurants serving wines whose grapes resonate with French names you've always known. Yadkin Valley has another trail too, luscious and sweet to embrace the mysterious sonker, distinctive to this region and beloved by families who prize their version as much as the reputation of others. Think cobbler. Or pot pie. Fruits cooked and blended, always with pastry that's not really shaped. The Surry County Sonker Trail features eight stops within 35 minutes of one another: coffee shop, general store, cafe, gourmet restaurant, upscale yet casual steakhouse and two bakeries plus Mayberry Pottery in Mount Airy to find cookbooks and pots to make your own. · The topography is ancient with the Appalachian Mountains as old as the Himalayas. This is not some brochure-writing notion; this is extensive research documenting every aspect required to designate a region - American Viticultural Area. Shelton Vineyards is where I learned that. The brothers behind this estate winery in Dobson don't intrude with all they could brag about if so inclined. I had to hunt up the backstory so I could boast for Ed and Charlie Shelton. Seems they made a comfortable living in the construction industry and wanted to create jobs for others, growing the economy with grapes. After all, tobacco was no longer the region's agriculture titan. Not a whim, this planting in 1999—science. 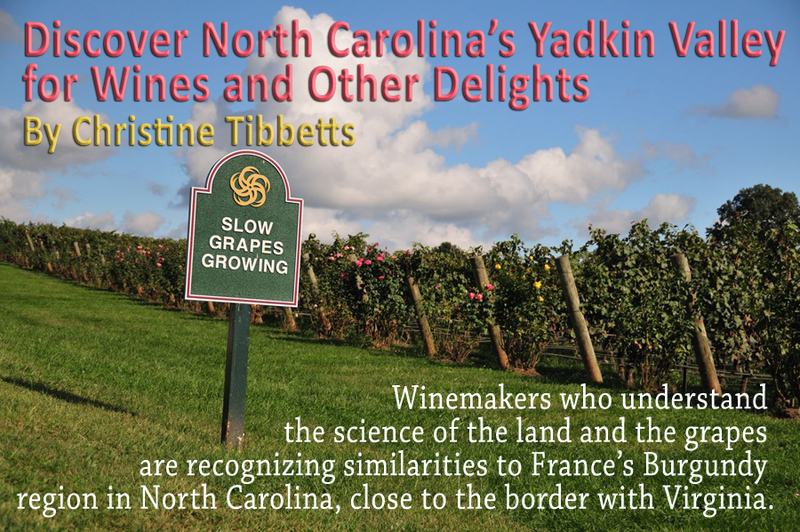 By 2003 the research they launched determined the Yadkin Valley is an American Viticultural Area. Pleasant choices like those filled my winetasting agenda in the Yadkin Valley. Stay several days and enjoy each style. Stay where? Hampton Inn & Suites Shelton Vineyards has easy access from Interstate 77 in Dobson. Wine bar in the lobby, open 5:00 – 10:00 p.m., and Shelton wines for sale by the bottle in the next-door gas station convenience store! Free bikes to borrow for the two-mile pedal to Shelton Vineyards, or hop on the free shuttle for tastings and vineyard tours. Linger because the Harvest Grill is three Diamond dining. Romance in the woods is another lodging possibility with four cabins at The Depot at Cody Creek, also in Dobson, but neither pets nor children invited here. The restaurant is full service with full portions and a rustic ambience. 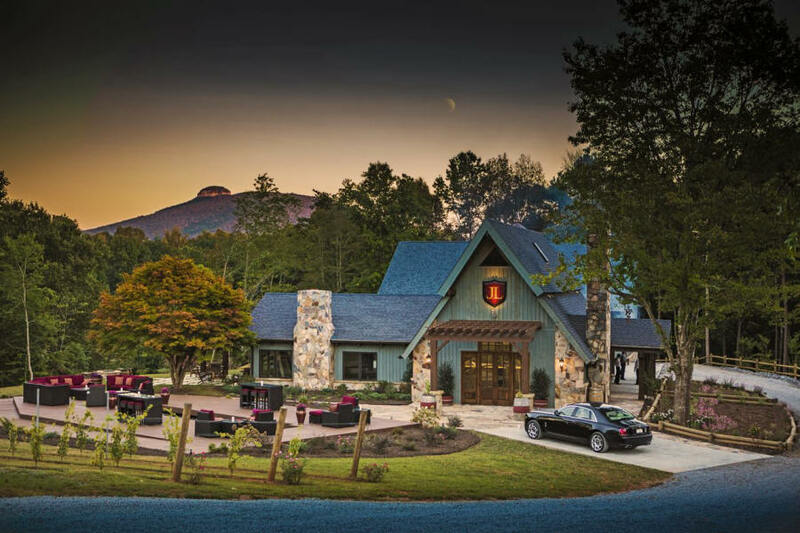 Overnight romance and fine dining distinguish JOLO Winery & Vineyards, elegance in sight of Pilot Mountain on 81-acres. Spectacular, including the one cottage for rent. JOLO Vineyards is an elegant experience, with fine dining, grand views and romantic overnight options. Dining at JOLO means full French service, say owners JW and Kristen Ray, in the intimate 24-seat End Posts restaurant. Allow three hours to savor seven courses. Elegance is the mood in the JOLO tasting room too with lead crystal glasses, a new one for each taste. Ever seen a fine dining open kitchen in a tasting room? You will in this boutique winery. The Yadkin Valley also offers lodging in Mount Airy, including the childhood home of Andy Griffith, a 1950s Mayberry memories motor lodge, a bed and breakfast and traditional hotels. Four creek side cabins, 400 square feet each with queen bed, sleeper sofa and a kitchen, can be rented at Elkin Creek Vineyards. Kids welcomed. Downtown Elkin provides the settings for art, live music, wines and conversation. 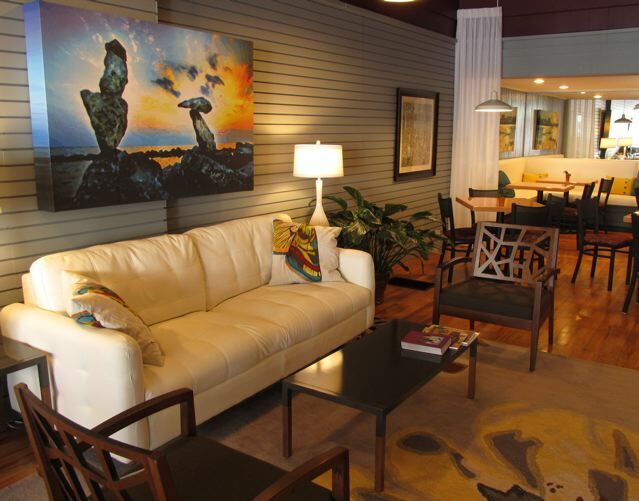 Sleep at Elkin Creek and you'll be staying with Blue Man Group performers from Las Vegas. The two couples relocating for a wine life also present wood-fired sourdough bread pizzas and farm cheeses from local grass-fed cows—happy cows, they say. Some people think Muscadine when they contemplate southern wines. Change your mind if you are one of them. Ten varietals grow well here: Merlot, Cabernet Franc, Tannat, Cabernet Sauvignon, Sangiovese, Chardonnay, Riesling, Viognier, Sauvignon Blanc, Petit Verdot. 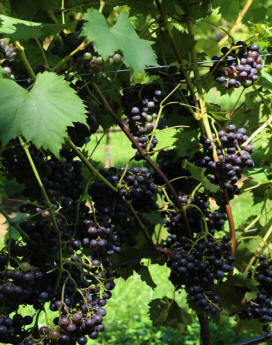 Discover an 11th when you visit Round Peak Vineyards in Mount Airy where Ken Gulaian works with Nebbiolo grapes. "They're unique to this region and fairly unique within the United States," he says, "yielding a robust, dark medium-bodied wine." Ken forecasts the Viognier will gain fame as North Carolina's most distinctive wine. He's also brewing three craft beers. Take a picnic to Round Peak—named for the fiddle playing technique of Tommy Jarrell who grew up at the base of the mountain dominating the view here. Saturdays the grills are fired up too. Perform slowly with passion. 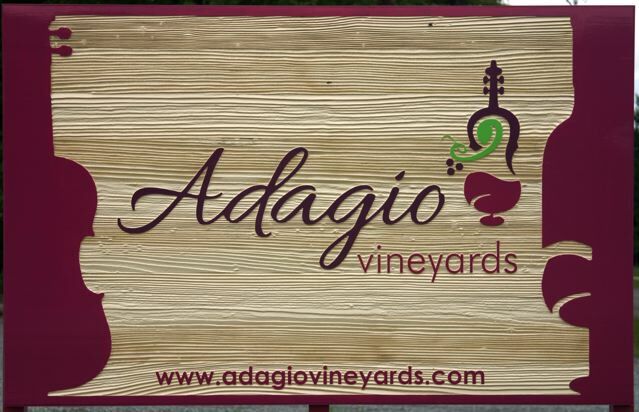 That's what adagio means to musicians and Adiago Vineyards knows the score. Good chance this is the only winery owned and operated by dentists, one of whom is also a classical violinist. A winemaking violinist! Find her at Adagio Vineyards in the Yadkin Valley. Photo courtesy of Craig Distl. Dr. Janice Wahl's skills extend to violin crafting, and the tasting room features graceful pieces ready to become instruments. "We have violin making, winemaking, beautiful music and wonderful wines, all in the same place," says Dr. Tim Wahl, a certified sommelier. "Adiago applies to each." Choose a downtown experience in Elkin at Brushy Mountain Winery and also allow time on either side for walking the wooded trails, exploring shops and ordering a good meal. The two-story building known as 21 & Main is a handsome gourmet deli, distinguished with art and bricks as much as food as suitable for travelers as for local folks. Good cheer is what I found at Brushy Mountain where winemaker Jason Wiseman delights in discussing the flavors of his dry wines "in this land of sweet tea and Coca Cola." Large paintings by local artists fill the walls of this 1900s-era cannery and a guitarist softly plays in the front window, notes to match the wines, soft enough to allow conversations. All the winemaking happens on site, Wiseman says, in this building and for him that translates to this: "Four days a week I'm lonely in the cellar and three days happily up on top meeting people." Brushy Mountain grapes have come from the same vineyards and growers since the inception, leading to 12 wines and an occasional new varietal. Mount Airy is a city destination all by itself, with or without being a Mayberry fan club follower of Andy Griffith but that's another story. Trailing Yadkin Valley wines, the downtown experience here is across the street from an excellent history museum—way more interesting and broad thinking than one might expect. Old North State (ONS) is the tasting room, a big space with a long bar and high stools for engaging with 12 to 15 wines, many in Fish Hippy labeled bottles. "Drift off course" the logo encourages. ONS serves deli and tapas-style lunch and dinner, with live music many evenings, in this building dating to 1885.